Need a job? You need this e-book first! Do you have the tools necessary to get hired in this job market? Phoenix hiring expert Mike Hayes knows the tricks to getting hired and shares them with job seekers in his new e-book. (April 2012 – Phoenix, AZ) “The Difference Between Being a Tool and Having the Tools. 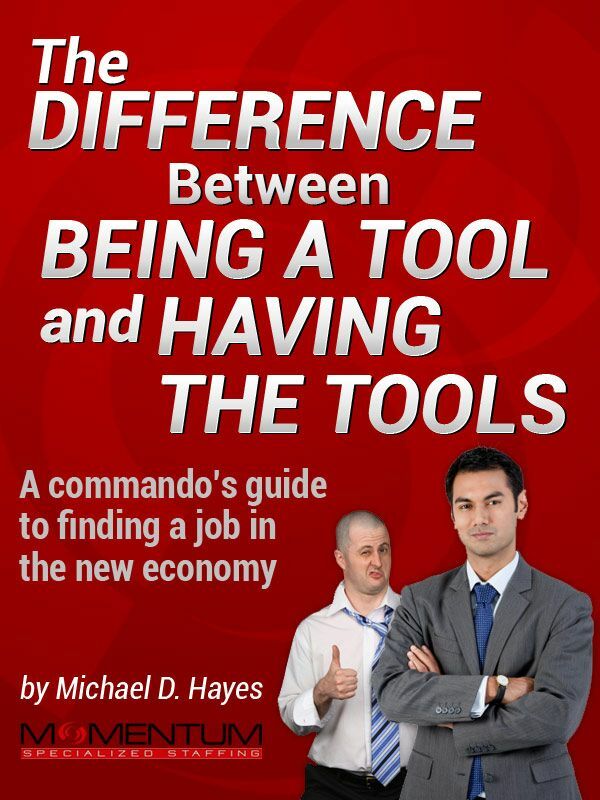 A Commando’s Guide to Finding a Job in the New Economy,” is available now for $2.99 on Amazon and at http://jobseekertoolkit.com/. Hayes’ unique, straight-forward approach and no-holds-barred attitude makes him invaluable to job seekers at every level. This book gives job seekers a plethora of useful information which will lead to a significant advantage over other candidates. Tips include; how to account for the time you have been out of work on your resume or in an interview, how to network properly and effectively and how social media can impact your ability to be hired. Not to mention help preparing for the toughest interview questions! This e-book is a quick read that gives potential employees quality, useful and concise information for finding the perfect job. The e-book can be used as a resource or reference guide. Doing so will increase odds of getting a position by 50% or more! ABOUT MICHAEL D. HAYES: An Arizona native, Hayes graduated from Northern Arizona University with a Bachelor of Science in Business Administration and received his Masters in International Marketing from Thunderbird, The American Graduate School of International Management. He spent 14 years gaining professional experience in the securities industry, advising banks, mutual funds and individuals on various types of investments before determining his experiences could benefit a wide spectrum of employers and (potential) employees. In 2003, Hayes purchased Momentum Specialized Staffing. At that time, the company’s primary business line focused on recruiting for logistics companies. Since then, he has transformed the company into a successful, full-service boutique staffing provider. Frequent appearances on-air and contributions to print media have led business writers and reporters to dub Michael D. Hayes, owner of Momentum Specialized Staffing, the “jobs expert.” Featured in local and national media, including Phoenix Business Journal, Arizona Republic, and Yahoo.com, Hayes is committed to strong, straightforward and frank career advice and finding jobs for his vast clientele. Besides leading Momentum, Hayes is a member of the Executives’ Association of Greater Phoenix (EAGP), 100 Club of Arizona, Men’s Art Council, Arizona Business Leadership, Biltmore Toastmasters and the Arizona Trucking Association. Mike Hayes provides tough, candid comments and advice on how to find jobs and recruit the right people in the new economy. He is a vigorous, energetic speaker for groups, and a strong, thought-provoking source for media. This entry was posted in blog and tagged AZ, career, e-book, ebook, employment, interview, job, Momentum Specialized Staffing, resume. Bookmark the permalink.